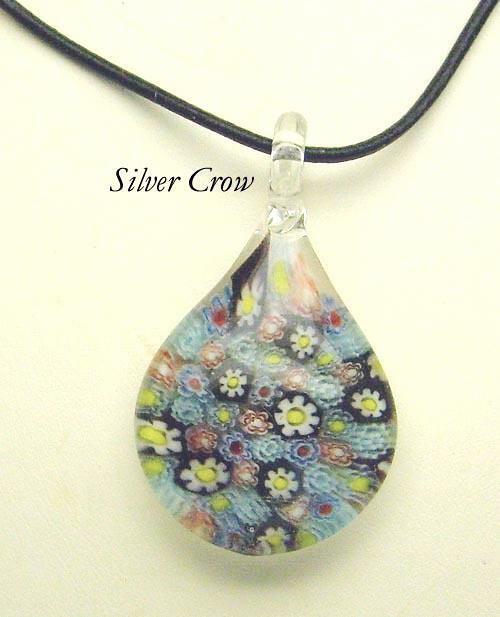 Murano Milifiori Glass 28mm x 50mm Black Cord Silver Tone Metal Length 20" with extender Condition Excellent Murano Gift Box Included Ships 1-3 business days Subtle but eye catching Murano milifiori pendant in a teardrop shape. Pendant is strung on a black cord with silver tone trigger clasp. 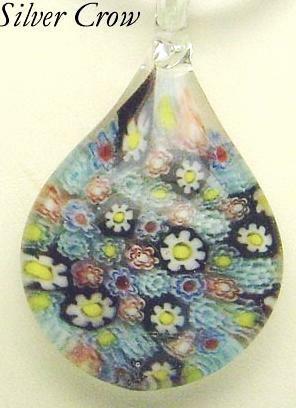 I picked this pendant and four others up at auction so they are pre-owned but in excellent condition. Vintage pre-owned jewelry sells as is so please look at photos and ask any questions before purchasing. Thanks for shopping at Court of the Silver Crow. We appreciate the visit. I have a large variety of styles and price ranges to choose from so take a minute and enjoy browsing through my handcrafted and vintage treasures for that perfect item at Court of the Silver Crow .